Regarding those under 21, the Massachusetts law regarding alcohol consumption is clear: Don’t. Further, if you host a party at which underage drinking is occurring, you need to be aware that you’re opening yourself up to potential liability, particularly if one of those underage guests takes off in a car. First of all, M.G.L. Chapter 138, Section 34 makes it a criminal offense to furnish alcoholic drinks to someone under 21, and punishes violators with up to 1 year in jail and/ or a $2,000 fine. Beyond that, you could be held liable to pay damages to the minor or any third parties who are injured as a result of minors consuming alcohol you provided or allowed to be consumed. A recent case out of Maryland, where similar laws exist, was pursued after an under-21 drinker left a party and caused a car accident, killing one and seriously injuring another. 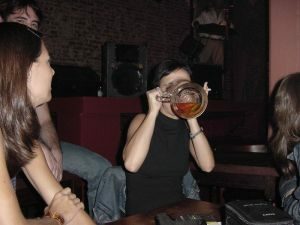 That case, Kiriakos v. Phillips, resulted in the Maryland Court of Appeals (the highest court in that state) issuing a determination that adults who allow underage drinking on their property may owe a civil duty to injured persons – including the minor who was drinking – and that defendants in this case owed both victims a duty of care. That was a reversal of the trial court’s ruling. According to court records, this case was consolidated from two negligence lawsuits filed that stemmed from two drunk driving accidents. The state high court went so far as to note that young people, while they are near their lifelong peak of physical health and strength and even mental capacity, they are still developing in ways that suggest they aren’t fully capable of handling some of the world’s more dangerous elements. Alcohol is a prime example. One way young people circumvent the minimum drinking age law is to turn to adults over 21 to purchase the drinks for them. In one of those cases, a 17-year-old boy became intoxicated at a party hosted by the parents of one of his friends. Another party-goer, 22, was also drunk. Both were still intoxicated when they left the party early the next morning, the 17-year-old in the back of the pickup. Shortly after they left, the pickup truck driver crashed and the 17-year-old was killed. Evidence revealed that the homeowner did not invite guests to the home, but rather showed up to find a large crowd was at her home. She did tell her son that some people would need to leave, but she allowed him and a few other guests – some of whom she knew to be under 18 – to stay in the garage and continue drinking. She reportedly stayed in the house playing solitaire. And when one of the party-goers went to her and expressed concerns about her brother (the 22-year-old driver) leaving in a vehicle while intoxicated, she failed to take any action. She also did not attempt to stop any impaired persons from leaving in a vehicle from her property. Such was reportedly a common occurrence. The state charged her criminally, but this case arose from negligence actions alleging social host liability. The trial court, in a decision later affirmed by the appellate court, decided the negligence lawsuits filed by the victims failed to state a claim because defendant did not have a legally cognizable duty to the victims. In another case, a woman walking her dog one morning was struck and almost killed when an 18-year-old drunk driver struck her. It was later revealed that the 18-year-old had been furnished alcohol by an adult. She sued that adult for social host liability, but here again, the trial court decided in favor of defendant for failure to state a claim. The state supreme court reversed in both cases.